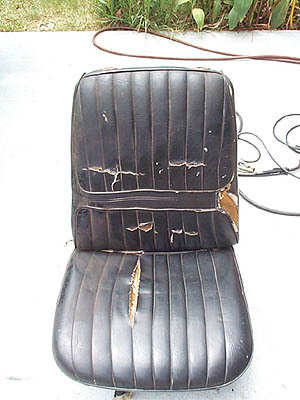 Here is a bucket seat that is going into a 72 Skylark coupe that had a bench seat. This particular seat came from a 1972 Cutlass. The headrest was missing and the rest of the seat is in good condition. 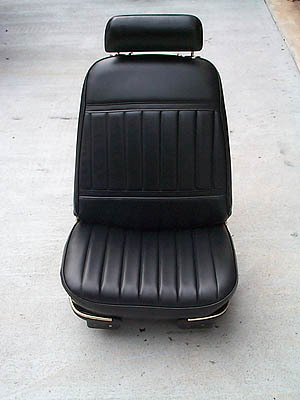 These seats can be found in GM A-bodies from 1968-72 including Cutlass/442, Chevelle/SS, LeMans/GTO, 70-2 Monte Carlo, 70-2 Grand Prix and X-body 68-72 Nova. They can also be found in full size cars(B-body) such as Rivera, Toronado, Wildcat but the legs will have a different configuration. 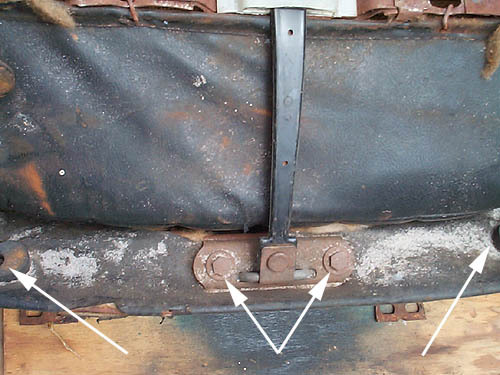 In order to place buckets in a bench seat car, you will need to order the bucket seat brackets to weld to the floor. Power bucket seats use different floor brackets than manual seats. 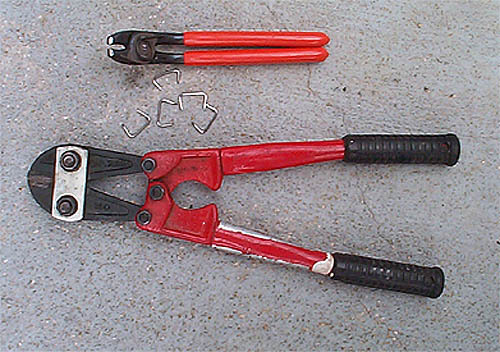 Here are some simple hand tools required to recover the seats. The top tool is hog ring pliers. These are special pliers for bending the hog rings into a circle. When you buy the rings they are shaped like the letter "C". The bottom tool is chain (bolt) cutters to remove the old hog rings. Here is a close up of the hog rings. 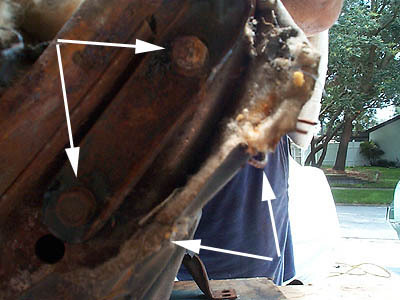 You can buy these from most aftermarket A-body suppliers or any auto trim shop. This is some spray grease that I use to lubricate the sliders. Each slider has four ball bearings. Spray grease on each one to ensure smooth sliding action! Remove the lower plastic skirts. Each is held in place by three Phillips screws, two on the front and one on the lower rear side. Remove the chrome push button seat back release from the upper plastic back plate. Use a large flat blade screwdriver or large putty knife to gently pry up the button. With the button removed, you will see two screws that need to be removed. Also on the bottom edge just to the right of the upper back cushion guide will be another Phillips screw. Remove that screw and slide the plastic back panel up. 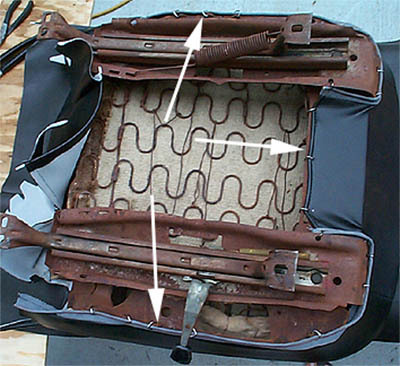 On the the lower seat cushion as shown above, remove the two rubber bumpers shown by the far left and far right arrows. They are held in place by a Phillips screw. 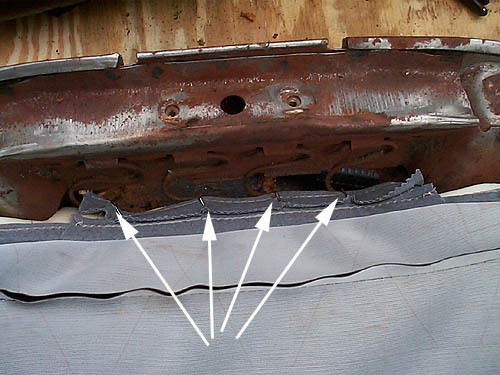 Now, remove the upper cushion retainer strap, center arrows, it is held in place with two 7/16" hex head screws. Cut the hog rings indicated by the the right lower arrows with the bolt cutter. This will reveal the side hinge screws, 1/2" hex head. Remove the screws on both sides and set aside the upper cushion. Now go around the lower seat cushion perimeter and cut all hog rings. Remove the seat cover and old foam. 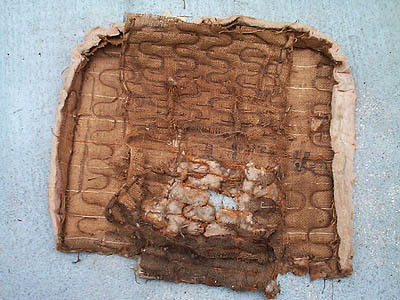 Pictured above is the burlap/cloth cover that rests between the foam and springs. This one is shot and will be replaced. Best solution I have found is to use a piece of house carpet that has a burlap or jute backing. Now is the time to inspect all springs and make repairs. You can buy replacement spring kits if needed. 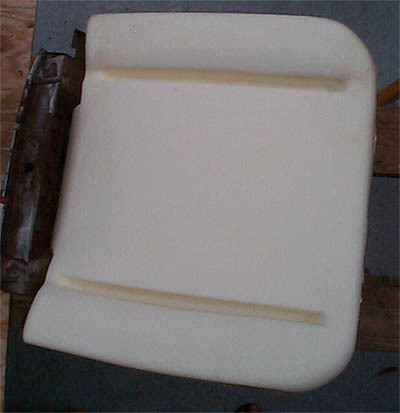 Here is the new lower seat cushion foam. If your seats are original, you should replace the foam due to age and wear. Putting new covers over old foam will not feel like a new seat and may not fill the seat covers to give a smooth finished look, you do not want the seat covers to be lumpy or wrinkled. Here is the lower seat cover put in position and anchored to the seat springs. This is your starting point for installing the hog rings. On new seat covers, the seam has a plastic rod sewn in place. On the old covers, there is a corrugated rod. If your new covers do not have the plastic rod, you will have to reuse your old one. So, don't throw out your seat covers until you complete the seats. 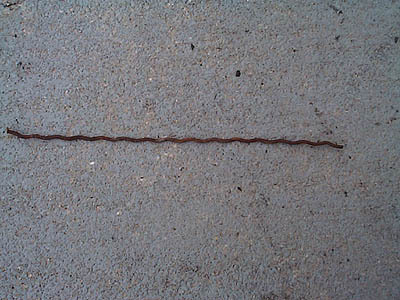 This is the orignal corrugated rod as discussed above. Here is the lower cushion flipped upside down. The middle arrow or right arrow shows the next anchor point that has to be installed with hog rings. After completing these three hog rings, work your way around the perimeter making sure you have no wrinkles. Also, notice the carpet on the seat springs that replaced the old burlap that was worn out. These section is done. Notice the loose material on the left. This must be left alone until the upper seat cushion is attached to the lower section. The material will cover the hinge bolts and give a smooth finished look to the seat. 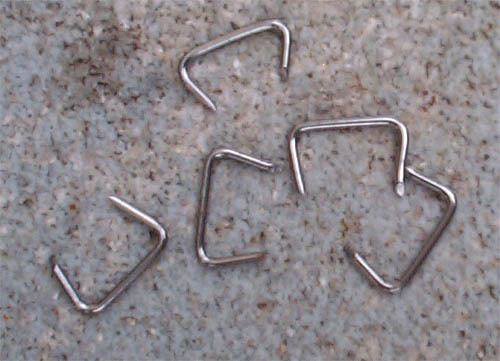 Use hog rings to cover the hinges, only two are required to join material sections. The last item to install is the plastic trim panels. The process is the same for the upper cushion. Take your time and do one seat at a time so you can use the old one as reference in case you forget where the anchor points are for each hog ring. Total installation time was about one hour per section or four hours total to do both seats. As you can see from the prices listed above, you can easily spend over $600 to recover/restore a pair of bucket seats. It is always a good idea to start with the best condition used seats that you can find for a reasonable price or find some that may already be recovered.